Aerials 4 U - Telecommunications, TV Aerials/Satellite Services based in Camberley, Surrey. Invoice history based on 743 reviews. 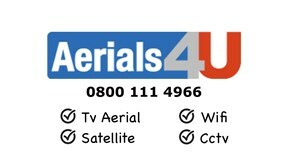 Aerials 4 U are dedicated to providing an exceptional standard of service on all installation and repairs for TV Aerial and Satellite needs across Berkshire, Hampshire, Middlesex and Surrey. With 30 years’ experience and genuine local knowledge of the reception in the area. With a fixed price list, I am sure we will successfully cater for all of your needs. Free No Obligation Site Surveys on all NEW INSTALLATIONS. Areas Covered: • Ascot • Woking • Cobham • Farnham • Deepcut • Bracknell • Chobham • Guildford • Aldershot • Sandhurst • Camberley • Godalming • Farnborough • Virginia Water • And all surrounding areas. am the most senior engineer in the business, I have been working in the TV Aerial & Satellite industry for nearly 30 Years. After working for a large, well known local company for many years designing – installing & servicing TV Aerial & Satellite Systems for the public and many local councils i have the knowledge and experience to take on all aspects of TV Aerial and Satellite systems. From a single TV to a 5000 Point System, I have gained a vast knowledge of the trade. I also have a wide range of knowledge and experience working in the Home AV sector of the industry, installing, servicing and repairing all aspects of systems. I am the specialist in the European Satellite sector for the business so for any advice do not hesitate to contact me.